Animal organs. Integument. Thin skin. Atlas of plant and animal histology. Species: rat. (Rattus norvegicus, mammal). Technique: paraffin embedding, staining with hematoxylin-eosin. In mammals, two types of skin can be found: thin and thick skin. Although there are intermediate forms, the thickness points to different functions and locations in the body. In this picture, a section of thin skin of the hand of a rat is shown. It is of notice the thin epidermis, whit a thin corneum stratum so that this skin is less keratinized (see this figure to distinguish the epidermis layers). The epidermal ridges are also less visible. These features make this skin not suitable for counteracting strong mechanical stress and it is located in places of the body protected from rubbing or frictions. In other parts of the body, where the mechanical stress is even less intense, there is thinner skin like in the ears (see image below) where the epidermis is so thin that it cannot be distinguished the granulosum and spinosum layers of the epidermis. 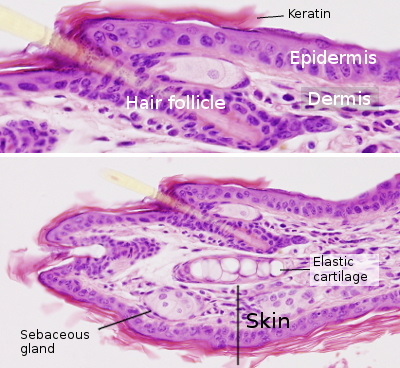 In the thin skin of mammals, the epidermis invaginates to form the hair follicles, tubular structures that go deep into the dermis and hypodemis and produce hair. Sebaceous glands are associated with the hair follicles and release their content into the hair follicle cavity, the space surrounding the hair stalk. Sebaceous cells are large cells showing a central round nucleus and a clear cytoplasm. The lack of color of the cytoplasm is a consequence of the large amount of lipid these cells had in the cytoplasm. Lipids are extracted during the histological process. In some areas of the body where there is no hair, like in lips, labium minora of the female sexual organ, prepuce and glans of the male sexual organ, the sebaceous glands release their products directly to the surface of the skin. Sweat glands are also found in the thin skin, though they are not visible in the image above. Sweat glands release their products either directly to the skin surface (eccrine) or the interior of the hair follicle (apocrine). Picture of a rat ear. The skin is made up of a very thin skin, showing a slim epidermis, with little keratin forming the corneum stratum. The dermis is also scarce and the hypodermis is missing. The bubbles-like structure in the middle of the ear is no adipose tissue, but elastic cartilage. 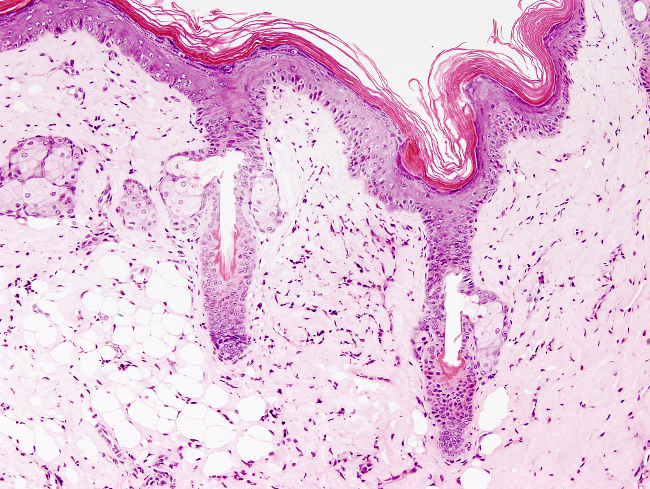 a) Papillar dermis. It is located just below the basal lamina and forms the dermal papillae of the skin. It is loose connective tissue with abundant blood capillaries involved in the nourishment of the epidermis, which is not vascularized. Blood vessels also regulate the body temperature by vasocronstriction and vasodilation. In some dermal papillae there are mechanorreceptors, like Meissner corpuscles, involved in sensing light skin stretching, and Pacini corpuscles, involved in sensing pressure. These and other mechanical receptors are more abundant in those areas of the skin specialized in touch sensing. In the papillar dermis, there are temperature and pain receptors as well. b) Reticular dermis. It is located under the papillar dermis. It is irregular dense connective tissue with abundant collagen and reticular fibers. Hair erector muscles, which are smooth muscle cells, are also found in the reticular dermis. These muscle cells allow the hair to stand erect when it is cold or as a consequence of the animal behavior. Other components of the reticular dermis are nerves and blood vessels. The hypodermis is the deeper layer of the skin and its thickness depends on the skin area of the body and the feeding state of the animal. The hypodermis contains large amount of fat cells.